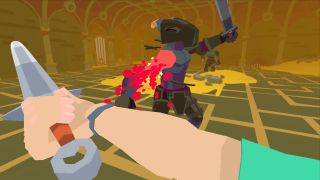 Resting near the center of the Indie Minibooth (a satellite of the Megabooth) at PAX East last weekend was a game that made us laugh more than anything else at PAX—Dad By The Sword: Swordplay Simulation Tactics. Rocketgames, the three-person developer out of Washington state, is mostly known for its iOS efforts, but it's come out swinging with an insane premise for its first PC-first game. To learn more about how the combination of dads, blades, hot dogs and jean shorts add up, I spoke with Rocketcat's Kepa Auwae on the show floor. Later, he drew a hot dog for me on a very expensive ASUS laptop that one of you will eventually win. This is my job sometimes.